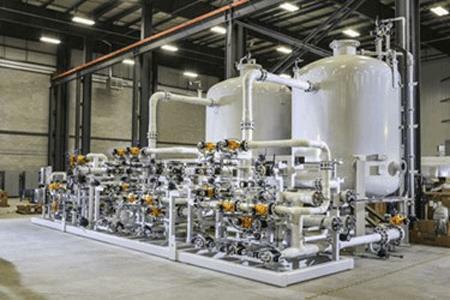 Condensate polishing is a proven method of producing high purity demineralized water from recovered boiler condensate. Condensate polishing differs from regular ion exchange in that ion exchange is only part of the overall process as the condensate is already of high quality and only requires polishing. The other main function of condensate polishing is to physically filter corrosion products from the boiler condensate. A properly functioning condensate polisher is therefore just as likely to require back washing and regeneration based on increasing pressure drop as it is based on ionic exhaustion. The ion exchange of the process involves exchanging the contaminant ions with hydrogen and hydroxide ions (for H-OH cycle) in a porous synthetic resin media.